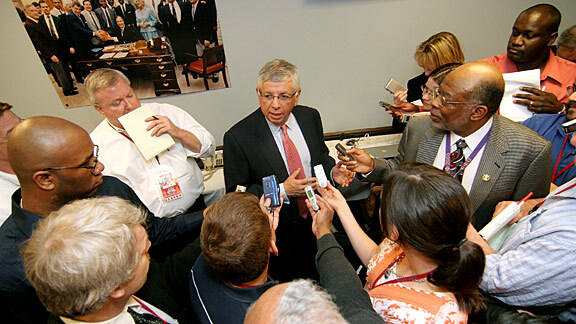 In 2007, David Stern staked out a position that is increasingly at odds with the evidence. When The New York Times published the preliminary results of research about referees and race by economists Joe Price and Justin Wolfers in 2007, the top brass at the NBA were livid. Stern and others at the NBA lashed out in spectacular fashion, at the researchers and the Times, calling the research "flat-out wrong" and a "bum rap." Three years later, emotions have mellowed, the research has been fully vetted and published in a respected journal. The NBA's position, meanwhile, is looking weaker than ever, offering an uncomfortable look at how the NBA addresses tough topics through the media. "I literally got the idea while reading 'Blink,'" explains Price. He was eager to discover if the implicit bias Gladwell described actually affected decisions in the real world, for instance in the workplace. Sports presented a special opportunity to learn a lot more, because referees make quick decisions -- the kinds that reveal implicit bias -- every night. "If I had as good a set of data on judicial sentencing, or hiring decisions, I would have gone and looked at those," says Price, who was then getting his Ph.D. at Cornell, and is now an assistant professor at Brigham Young. "In my mind, I don't have any issues with the NBA. I actually think they've achieved racial equality in so many dimensions. They just happen to be a lab setting in which I get quasi-random assignment, I get lots of interactions between a small number of actors. I get a perfect setting to look at racial bias. And in some ways, if it's happening on a court in front of thousands of people, then it's probably happening when you go to make purchasing decisions, or hiring decisions, or whatever decisions we can think of as more important." And sure enough, Price and Wolfers found evidence of implicit bias among NBA referees. They didn't find any big problem -- it was less racism than other researchers had found in other populations. But still, some. Most of the world found this fascinating and curious -- maybe something to learn from. The good news was that the NBA was in a strong position to take the news calmly, as clearly any effects were subtle: There were not players, fans, referees, owners or anybody else complaining of racism. Most players met the news with the shrug. But at the league office, David Stern oversees a league that once had an image, in his words, as "too black" to succeed. No small part of his tremendous success as a commissioner has come from moving the great American conversation about basketball away from old racial paradigms. The NBA resolved to reject the ideas in this research. Stern and NBA president Joel Litvin were unrestrained in ripping the study to shreds. "The story," Litvin said at the time, "is based upon a paper that is flat-out wrong in its conclusions." "My major concern about it is that it's wrong," echoed Stern. "This is a bum rap, that's all. This is a bum rap, and if it is going to be laid on us it should be laid on us by basis of some people who are purported to be scholars in a publication that purports to hold us up to a higher standard -- a little bit more should have been done." Stern went on to claim that racism "doesn't exist in the NBA." Charles Barkley, LeBron James, Kobe Bryant, Derek Fisher ... they all rushed to defend their league. Some called the research out of line. And as a media maneuver, it succeeded. There are not routine public complaints about racism among referees. That idea has not really caught on. So, declare it a public relations victory for the NBA, in the short term. In the long run, though, that small victory packs a big blow to the NBA's credibility, especially on the topic of referees. The kind of racism Stern insists does not exist in the NBA has been shown by study after study to exist at some levels in every population tested. The NBA's chosen targets: Wolfers, Price and the New York Times reporter on the story, Alan Schwarz, are all highly respected in their fields. And after having been lauded by experts for the Times, ESPN and others, the exact study the NBA was so sure was wrong was, on Friday, published in one of the most respected, peer-reviewed academic journals in the field: The Quarterly Journal of Economics. The best experts agree, after rigorous review and much consideration, that there is a low level of implicit bias among NBA officials, just as there is among people all over the globe. The essential findings of the report published Friday are the same as what they reacted to so strongly in 2007. Which need be neither surprising nor damning, taken in the proper context. Researchers have found similar results among Major League Baseball umpires, for instance. And among Oprah viewers, and everyone else who has ever been tested for implicit bias. The NBA would not comment for this article. But three years ago, the league did not just crush the research with words, but also with competing evidence of their own. Litvin told Chris Sheridan at the time that only the NBA had the good research on this topic. "We conducted our own study with experts in mathematics and statistical analysis, and those experts, looking at far superior data that included 148,000 calls, concluded unequivocally that there was no racial bias in officiating ... We have the information on specific referees and the specific calls they made, and they don't." The NBA's big criticism of Wolfers and Price is that their database of 600,000 calls is missing one important thing: The knowledge of which referee made which call. Price agrees that would be nice to have, but insists it's not necessary to identify the trend. Their data -- collected from 1991-2003 -- shows, basically, that the whiter the three-man referee crew, the better the calls are for white players. The blacker the crew, the more calls favor black players. "Here's an alternative experiment we could do," Price explains. "Let's just look at games in which there are three black referees, and games in which there are three white referees. In that case I do know the race of the person that blew the whistle. And when we limit our analysis to just those types of games, then you still see the same racial bias that we're documenting for the full set of games." "If you knew who blew the whistle," he adds, "you could actually identify who the racist referees are. But actually what we found, when we looked at the patterns, is that it's not that we found there are any referees who are really racially biased. It's just that there's this consistent pattern, that black referees tend to favor black players and that white referees tend to favor white players. And the other thing that we found is that highest level of racial bias occurs when you have all white referees or all black referees." Basically, the more black referees on the court, the better the calls for black players. And the reverse is true for white players. The entire combined effect is fairly limited, around 4 percent, but the pattern is certainly there. All of this means not all that much about NBA referees, other than that they're human. The research was about human decision making in the workplace, and the referees were just a handy group to study. And nothing about these findings do much to undermine the NBA's position as one of the most successfully race-blind organizations on the planet. When you meet someone for the first time, or walk into a house you are thinking of buying, or read the first few sentences of a book, your mind takes about two seconds to jump to a series of conclusions. Well, "Blink" is a book about those two seconds, because I think those instant conclusions that we reach are really powerful and really important and, occasionally, really good. His book says that our subconscious, immediate reactions are ever-present and powerful. Sometimes they're powerfully helpful. Other times they're powerfully misleading. But ignoring them is no way to go, and tuning into them can be more than a little enlightening. "Blink" shows snap judgments, or "thin slicing" playing major roles in everything from, in his words, "marriage, World War Two code-breaking, ancient Greek sculpture, New Jersey's best car dealer, Tom Hanks, speed-dating, medical malpractice, how to hit a topspin forehand, and what you can learn from someone by looking around their bedroom." He also talks about race, which, of course, gets people's attention. Gladwell discussed that with Oprah Winfrey, in a clip I really recommend watching. The point: When you have time to consider things, you may not exhibit racial preferences. But robbed of time to consider, for instance by the online Implicit Association Test (or IAT, which you can take online right now) you may be surprised what your brain expresses. Oprah viewer Kia, who is black, was certainly surprised, after taking the IAT, at what the research said about her. Like the NBA, she had an urge to condemn the researchers, although her response was tongue-in-cheek: "My test results: I had a moderate preference toward white people. That surprised me like you wouldn't believe. ... I went home for a bit, and I analyzed it, and over-analyzed it, and I said well, I'm not the problem, the test is the problem." Gladwell himself, whose mother is Jamaican and black, admitted to Oprah that when his own instantaneous biases were measured he demonstrated a moderate preference for white people, too. The lesson Gladwell, Winfrey, Harvard researchers and others took from this was about environment: We may have reached a point where a lot of explicit racism (the kinds of things we'd associate with hate speech, the klan, segregation and the like) is largely behind us. But our brains are still bombarded with images of "bad" black people and "good" white ones, which affects our quick reactions to white and black faces. The Implicit Association Test results make clear, though, that we may have come a very long way in a short amount of time in our feelings about race, there is still plenty going on. There are not populations -- not Oprah viewers, not corporations, not black people, and no, not NBA referees -- who demonstrate broad racial enlightenment on this test of instantaneous reactions. "If you think about how Jackie Robinson was treated; we don't treat black players like that anymore," says Price. "We've gotten rid of a lot of those issues. We've gotten rid of explicit racial bias. But what's potentially harder to get rid of is the implicit stereotypes that we all carry inside." But, Price suggests, there is evidence we can still work to eliminate implicit bias. The key is awareness. "All of our decisions are probably influenced, to a very small degree, by some type of bias, whether gender, race or religion," he says. "I think we can cognitively repress that stereotype by taking the decision more seriously. In the psych literature, when they go into a firm, and they document these measures of implicit bias, it appears that once you make people aware, it appears to kind of help dampen that racial bias. Even in the baseball study, they found that having the QuesTec technology [automated oversight of referees' ball and strike calls] helped to reduce racial bias. If I know that you are going to evaluate me perfectly, then I'm going to be a little more careful in my call and I'm going to get it right more often. I'll be less focused on racial bias, and more focused on getting the truth." Here's where the NBA has an opportunity to score some credibility points: The data Price and Wolfers studied is, on average, more than a decade old. Since then, thanks to oversight changes after the Donaghy scandal, the ranks of referees are both more diverse and far more scrutinized than ever. Perhaps the referee corps started ahead of the curve, at about 4 percent racial bias as Price and Wolfers found, and has improved from there. Perhaps they have made tremendous progress already. The league is prevented from telling that story now, however, in part because they deny there was any bias to begin with. "I think if the NBA had just said: 'wow, we didn't realize this was going on. 4 percent, that's not that big. We're doing better than other organizations, but let's see what we can do about it.'" suggests Price, "that would have been the right response and it probably would have gotten the job done." Instead of taking a position that the study may have had merit, the NBA blew the study and its creators out of the water, while asking NBA fans to trust them that the real referee data, which they would not share with anyone, showed that referees were essentially perfect. "There is this idea," adds Price, "that you can make the data say whatever you want. If only it were that easy." To protect against charges of juicing the numbers, Price and Wolfers not only presented their findings in a peer-reviewed paper, but they also made all of the raw data available online -- the 600,000 calls. If only the NBA would back its own claims similarly. Perhaps, one day, the league's various self-serving claims on topics like racism and referees, the financial state of the teams, and more, will come with more than just theatrical put-downs, but also with evidence.